This is a brief guide to how the tenure process is handled at UMass Boston. This is brief in order not to bog you down in details that may never be germane to your personal situations. 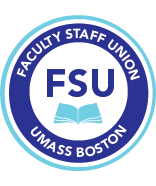 If, after reading it, you have additional questions, please call us at 7-6295 or email at fsu@umb.edu. Your Annual Faculty Report (AFR) is the vital record of your accomplishments for each year of your employment at UMB. Merit awards, reappointments, fourth-year reviews (reappointment through the tenure decision year), tenure, promotions, and post-tenure reviews all depend heavily on the documentation you provide in this report. They are used from the beginning of your career here until the end, and completing them thoroughly and carefully is a large favor you can do yourself. Completing them is a condition of your employment, so you may as well make them an accurate and elegant reflection of your progress in professional activity or research, teaching and service. Be sure to compare the current year's form with the prior year's, since you want to be careful not to mistakenly carry over the same pending projects from year to year, or to confuse one title with another. You will not complete an AFR in your first year, but you will do so at the beginning of your second year, and every year thereafter. If you are uncertain about some of the reporting categories, ask your Department chair or a senior colleague about what your department's norms are in filling out each section. You might ask if a colleague would let you see his/her report for a recent year, to see an example of how yours probably should look. Your AFRs will be kept on file in your department office, but you should be sure to keep a copy for your own records, complete with the comments appended by your Department Personnel Committee (DPC) and Department Chair. You should also read those comments very carefully; academics are sometimes indirect in their critiques of colleagues, and you need to pay close attention to what they are actually saying about your progress toward the next step in your career. It is a good idea to schedule a follow-up face-to-face meeting with your Chair or DPC Head if you are at all confused or unclear about any comments. Along with a file of all your AFRs, you should keep a current copy of your Curriculum Vitae. The careful review you perform to complete the AFR offers a perfect opportunity to update your CV at the same time. You can never tell when you will need a current CV – for conferences or grant applications, as examples – but you will certainly need one for all the major personnel actions you will undergo in your career at UMB. And you should keep on file all possible documentation to support your AFRs – teaching evaluations, thank you notes for service, copies of articles and books – in a convenient location for assembling your basic file for personnel actions. When you come up for reappointment through the tenure decision year, tenure, or promotion, you will be asked to compile a "basic file." This file is defined in the FSU contract (Article 12.6). What is not defined in the contract is exactly how this file is supposed to look, and that will vary from area to area. You will most likely include a "personal statement," which integrates your three areas of research, teaching, and service. It’s best to talk to your Department Chair or to a colleague who has recently (and successfully!) undergone a major personnel action. Ask the person what they have done in the past and what the norms are in your department. Ask if it is possible to look at their most recent basic file, to use as a model for your own. Many Colleges on campus are moving to a “paperless” system whereby all your materials will be organized on a disc or thumbdrive so you should be prepared to compile .pdfs of all your materials. When you come up for the reappointment that will carry you through the tenure decision year, you have an intensive review of your career to date. This review is alternatively referred to as a fourth-year review, a "4.2 review" (from the Redbook), or "mini-tenure." It is designed to provide you with information about any deficiencies in your record in time for you to remedy them before your tenure review. One important point: The mini-tenure process, even more than the tenure process, varies enormously from department to department. What is written here applies in many cases, but not necessarily in all. If in doubt, find out how things operate in your department. Remember that your aim is to shape a career – and a life! – that you feel good about. Along the way you may need to make some compromises, but start by thinking about what you want and value, and how you can explain to your colleagues why that’s valuable and a contribution. The fourth-year review has become like a minor version of the tenure process, except that most departments do not seek evaluations by external referees, although some do. So be sure to find out if your department does, because you will need to provide names for them. This is a major personnel action, and you will be expected to assemble a basic file for it. This is your first opportunity to pull together and document your contributions and doing so now will help you at tenure time. Seeing what is not documented helps you identify potential weaknesses in your case and helps you to understand what you need to do prior to tenure to address those weaknesses. The FSU Contract requires your Department Head to notify you within the first three weeks of the semester in which your review is to occur – typically the fall semester of the fourth year. In reality, you should clarify that well in advance so you can work on your basic file over the summer. Check with your Department Chair or the Chair of your DPC sometime in your second year of employment to ascertain exactly when your department performs the fourth-year review. Once you have submitted your basic file, you might think things are out of your hands, but you would be wrong. You need to monitor your case closely as it goes through the various levels of review, and to respond quickly if inaccuracies enter the record at any level, or if a negative recommendation is made. If either situation occurs, you should immediately contact the person or committee who is to consider your case next and ask them to hold off their review to give you an opportunity to respond to the previous evaluator(s). You should set a timeline when you make the request of no more than a week or two, so the evaluator knows when to expect your response. Do not write the first thing that comes to mind and fire it off; it is hard to be your own best advocate when this is the case. Ask a trusted colleague for help, or come to the FSU and we will help you formulate your statement, with particular attention to tone. The most important rule of any personnel review is to take the process seriously, to make every effort to make it easy for your colleagues to understand your record and contributions, and to fully document everything. The second most important rule, and the rule that is most often forgotten or misunderstood, is do not over-promise. Do not put into writing a commitment that prior to tenure you absolutely positively without-a-doubt will publish this, that, and the other thing, or that you will improve your teaching of large lecture classes, or anything else of the kind. Usually it is precisely the candidate who is aware of having a potential weakness of some sort (say, that you have not yet published enough) who feels compelled to promise that, if renewed, they will publish up a storm prior to tenure. The promises you make today can and will be used against you at tenure time. If you write that before tenure you plan to publish one book and complete the manuscript for another and also publish three articles in top refereed journals, you are setting yourself up for failure and inviting someone at tenure time to say “Well, yes, she did publish a book and two articles in top journals, but she is not close to completing the other manuscript,” - when in fact no one could possibly do all that before tenure. The third most important rule, and a rule that also gets misunderstood, is read your review letters carefully, looking for any indications of reservations. Here’s the sad truth: personnel committees, and chairs, and often deans, are extremely reluctant to write anything critical. The committee may have spent an hour or two talking about the fact that, although you have plenty of publications, too few of them are in refereed journals, and they just don’t know whether they could tenure someone with that kind of record. After agonizing about this, the committee may then write a letter 95 (or 98) percent of which is glowing, with just one sentence that hints at a reservation “The committee does, however, encourage Professor X to consider making it a higher priority to publish in refereed journals.” Probably the committee will also agree that someone should talk to you, and tell you in strong terms that you have a problem, which the committee didn’t want to put in writing. But then in practice, half the time the person who talks to you, who often will be a person who is firmly on your side, will put the point in such mild terms that you may not be aware how significant a problem this issue might be. It is therefore critical that you read your letter carefully, looking for anything that seems like it might be a criticism, and follow-up by asking colleagues about it, and what they think you need to do to address this concern. If in doubt, bring your letter to a trusted colleague, in your own department or another department, or to the FSU office, and get someone else’s help in evaluating the letter. Even if you disagree with the criticism, be sure you are aware of it, be sure you think about how to prepare for it coming up again, be sure you see if there are steps you can take to eliminate this concern in the future. When you have successfully completed the fourth-year review, do make sure to take any suggestions made during it. This is a time to look forward. What aspect of your record is most problematic? What actions are there you can take that would strengthen that? If there is a problem with your teaching, can you work with the Center for the Improvement of Teaching? If you don’t have much service, is there some kind of service activity you can do which your department would count as significant? This is your chance to round out your profile so it will meet departmental, college, and University norms for tenure. If it seems unlikely that you will be able to meet expectations, consider taking a leave and extending the tenure clock to give yourself the best possible chance to do so. Another thing you should be thinking about is the external referees. If you had to name some, do you know who they would be? If not, are there steps you could take to help you identify potential referees? Think about colleagues you’ve met at conferences. Think about sending your work to others and asking for their comments or reactions? Think about Googling yourself, and see what scholars assign your work in their courses, or cite you favorably. Those are all people you might be able to suggest as referees for your tenure case. Be sure to consider that it is important that external reviewers are respected in the field and could not be deemed “too close” to you to offer a valid assessment. Finally, remember that the FSU is here to help you. That means your colleagues from your own department and from elsewhere at UMB. We want to help you to understand the process, give you someone with whom you can discuss the issues, and let you benefit from our collective wisdom. This may mean putting you in touch with people who have recently been through the process, or sitting you down with someone who has served many terms on your college personnel committee (CPC) or showing you another’s fourth-year review file. We want to help everyone to do the best possible work, to make the best possible case for themselves, and to feel supported and valued by others. Let's start before your tenure decision year (TDY) in this section. If you feel you are not ready to undergo the tenure review, you may be able to postpone the decision – but only if you make arrangements prior to the beginning of your TDY. The Redbook gives examples of acceptable reasons for altering the timing of the review: up to three years for an equivalent amount of administrative service by agreement at the time the service is undertaken, leave without pay unless otherwise stipulated when the leave is approved, and temporary service at less than two-thirds time with the approval of the Dean and Department Chair. There are also other circumstances that may allow for postponement such as prior credit toward tenure, illness, parental leave, family medical needs, and other issues that have impacted one's ability to fulfill the probationary period for tenure. All these cases need to be presented to the administration for consideration, as early as possible prior to the TDY. The FSU can be helpful in advising faculty members about such requests and all assistance remains confidential. For new parents, a one-year extension is a contractual right. A faculty member (female or male) who becomes a biological or adoptive parent will have their TDY delayed for one year upon written notification of the birth or adoption by the faculty member to the Department Chair. The faculty member may have the tenure decision year restored to its original date if he/she wishes by providing written notification to the department chair no later than three months prior to the start of the original tenure decision year. You may ask for further extensions for later births or adoptions but allowance is discretionary. Tenure is virtually identical in process to the fourth-year review (see above), but it is even more rigorous and in all cases requires outside letters of reference. Most tenure cases begin in the fall semester, with notice going to candidates within the first three weeks of the semester that they will be reviewed for tenure during the current year. Clearly, you should be aware well before that notice; many faculty members spend the summer before their TDYs compiling their basic files and their list of referees, and it is advisable to take the time to create the best, most informative file you can. Ask a recent (successful) tenure candidate in your department if you can see his/her basic file -- you can use it as a pattern for style and content, and make it easy for both your DPC and CPC to follow. You should include all the information listed in Article 12.6 of the FSU Contract. You should also include pertinent back-up documentation for the activities listed in your CV and AFRs, such as letters of commendation for a presentation, analysis of your teaching evaluations over the years, etc. You will most likely need to write a personal statement – either an overarching one covering all three areas as a unified whole or an individual preface for each area. You also need to be sure your publications or other scholarly works accompany your file when you submit it. And you need to prepare a list of outside referees that has a number of renowned scholars in your field, preferably individuals you do not know personally, with a short paragraph for each, outlining who they are and why they are suitable as a referee in your case. The normal practice for choosing outsider reviewers is for the chair (or the chair of the DPC) and the candidate to sit down to look over the lists of names generated by both the candidate and the chair(s), although the chair(s) may choose some reviewers without consultation with the faculty member. The final selections must include, but are not limited to, those that the faculty member suggests. The contract does provide the right for the candidate to know the names of all the reviewers; (the names of the reviewers are included in the basic file’s Table of Contents). Actual referee letters are only accessible to the faculty member if he/she did not waive access to them; it is usually recommended that the faculty sign the waiver. Once you have submitted your file, you must monitor your case as it travels through the various levels of review. In some departments, the DPC and Chair deliberate separately and issue their recommendations separately; in some departments the deliberate together, and the two recommendations are issued simultaneously. In any case, when your file moves to CPC, you should receive an updated table of contents and copies of the recommendations made at the department level. The same should happen when the file moves to the Dean’s office and when the Dean sends your file to the Provost. The Master Calendar each year lists the dates by which these actions should occur; you need to be sure you know what is happening and that your file is moving forward in a timely manner. If at any point you disagree with the content of a recommendation, you should respond. Ask the person or committee to whom that recommendation has been sent for time to respond before they consider your case. Then get help, either from a trusted colleague or from the FSU. It is best not to write and send your initial thoughts without some assistance with content and tone; these are emotionally charged situations, and you deserve the help of an advocate in dealing with them. If the Provost's recommendation is positive, your case will go to the President's office and from there to the Board of Trustees In any case, if you are not going to receive tenure, you must be so notified by August 15th; if you don't receive notice, you receive an extra year's employment beyond the terminal year that normally follows your TDY. If you are successful, you can start planning your trajectory to your last promotion! When a department or program is too small to have a DPC to evaluate major personnel reviews, the Dean may appoint faculty from outside the department or program to serve on the DPC. In such a case, you will be asked if that is acceptable to you. 1. This document is a revision of the MSP, UMass Amherst, Guide to the Tenure Process.